CAPCO Energy Supply sells only to the trade. Consumers are welcome to contact us for referrals to qualified installing contractors in their area. Everyone here at CAPCO is ready and well-prepared to help you in any way we can. We’re available Monday through Friday, 7:00 a.m. to 5:00 p.m. EST to take your calls at 781-721-0303. Or you can email us your question and we’ll get back to you within one business day. CAPCO Energy Supply has long been known for its unparalleled customer service. We truly believe an educated customer is a successful customer. In a time when many wholesalers direct technical questions back to the manufacturers, CAPCO has been known since 1978 for its “hands on” approach to problem solving. CAPCO has invested hundreds of hours of specialized training in our staff and customers. We know our products and stand behind them with technical support that is unrivaled in the industry. We are intimately knowledgeable about the products we distribute and support. Capco has extensive product inventory and repair parts to make sure we are able to support our trade customers to the highest industry standards. Our industry is constantly changing. These conditions require a mutual commitment between us the supplier, and you our customer to be vigilant in product training, understanding new technologies and concepts, and making a commitment to providing the highest level of customer service possible. 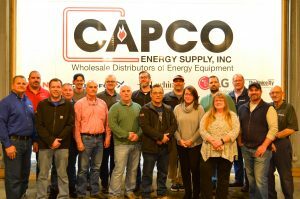 Capco (Cambridge Alternate Power Company, Inc) was incorporated in the Spring of 1978 to provide efficient energy equipment products to the Metro Boston residential homeowner market in response to the OPEC oil embargo of 1973-1974. Capco Energy Supply, Inc was established in 1979 to distribute these same products to trade customers in Eastern Massachusetts, New Hampshire, and Rhode Island. The original product offerings were concentrated in Multi-fuel wood/oil boilers, wood stoves, solar thermal systems, and wind energy. Since many of these products were new to Capco’s ever expanding trade customers, the requirement of comprehensive product training and technical support, became a logical imperative. These early conditions created a company philosophy of providing hands on training and technical support that has evolved over the decades and remains the centerpiece of Capco’s identity to this day. In the 1980’s and 1990’s a number of world class European heat equipment manufactures began exporting their products to North America and also established a corporate presence in the US and Canada. In addition to products that were decades ahead of the existing heating equipment in the US, these German and Italian companies introduced new heating concepts such as radiant floor heating and system efficiency concepts that were unfamiliar but provided more comfort and energy efficiency. Capco embraced this opportunity of innovation and integrated these European heating concepts with the North American building materials, architectural designs and lifestyle. As time has progressed Capco has been able to build a deep level of institutional knowledge about state of the art residential and commercial heating, domestic hot water production, and cooling that is unique for a specialty single branch distributor. Capco distributes the highest quality products from North American and Europe and provides a comprehensive and integrated approach to our trade customers to successfully sell and install these products to their customers.